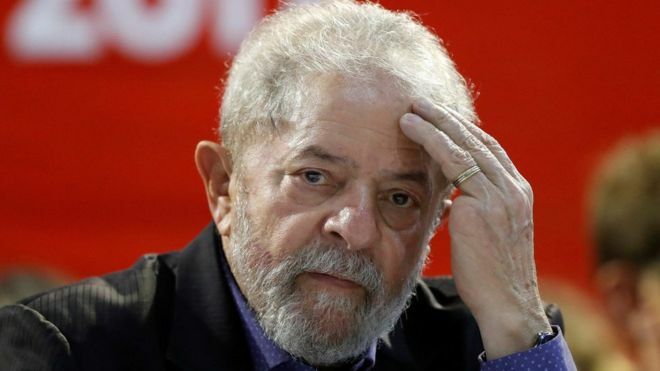 Former Brazilian President Luiz Inacio Lula da Silva has been convicted of corruption charges and sentenced to nine-and-a-half years in prison, court documents show. The judge ruled he could remain free pending an appeal. Lula has rejected claims that he received an apartment as a bribe in a corruption scandal linked to state oil company Petrobras. He says the trial is politically motivated and denies any wrongdoing. The case is the first of five charges against him. Lula served eight years as president until 2011 and has expressed interest in running again in next year's elections for the left-wing Workers' Party. On Wednesday, a judge found him guilty of accepting bribes from engineering firm OAS in the form of a beachfront apartment in return for his help in winning contracts with the state oil company.